Went to the Robinsons Expo Sale 2009. The eyeshadows were all right. Not very pigmented and rather shimmery. Cha Cha was something I've been wanting to get so I'm kind of glad I got it cheap. It's minty green but has golden shimmers. I find it very pretty for a spring colour. Though I'll probably have to use it wet to get it to show. 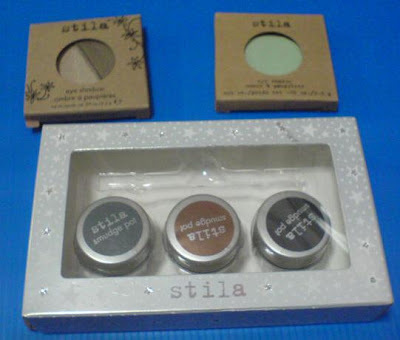 A very small picture of the swatches. Pictures didn't turn out clear. Could only savage it by resizing. Top to botom: black, bronze, gray. 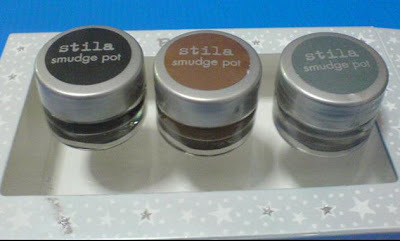 The smudge pots are very creamy and soft. Used my own Silk Naturals eyeliner brush (which I didn't really like either for it's too thin) for swatching. Bronze turned out great, very smooth. I didn't really like how black and gray turned out. It was a little uneven and smudgey. But they seemed great for smudging eyeshadow. Very easy to spread and blend. Overall I'm rather pleased with it. Was planning to get a few more Indelible Gel Liners and Creme Eyeshadows from MAD Minerals. Now I can save some money. I own only one Indelible Gel Liner in Chocolate Mousse. In comparison, I still prefer Indelible gel liners. Very easy to use. The only problem I have with them is sometimes, will find them too dry or dry up too fast. That's why I don't really want to buy too many of them in one go. I think I might go down Robinsons Expo Sale again! :D Didn't buy much this time because I wanted to leave before it gets crowded.